The only large cat with stripes, tigers live in fragmented habitats throughout eastern and central Asia. Their fur usually is orange, with southern species displaying rich, almost reddish hues and northern species showing paler coloration. Black or brown stripes appear not only on their fur but also on their skin. Tigers' fur actually helps them blend into their environments. Tigers’ stripes help conceal them in their preferred habitats, such as grasslands and forests, where shadows and branches create a stippling effect that matches the stripes. Combined with many animals’ lack of color perception, this effectively enables tigers to remain camouflaged while they stalk their prey. Ambush attackers, before striking they creep to within 15 to 30 feet of potential prey, which includes deer, elk, water buffalo, feral pigs and other large ungulates, as well as bears, young rhinos and even elephants. Tigers live in a range of environments, from tropical areas in southern Asia to subfreezing zones of Siberia, where temperatures can dip to 40 degrees below zero Fahrenheit. Fur helps the northern subspecies, such as the Amur or Siberian tiger, survive extreme cold; they have longer, thicker and denser fur than southern subspecies, and they grow heavier coats during the winter months. In warmer climates where tigers need to cool off, they take advantage of their camouflaging stripes to lounge in shadowed streams and ponds. Like human fingerprints, no tiger's stripes are exactly the same as another's, although subspecies have similarly shaped markings. While people might have trouble distinguishing individual tigers based only on stripes, it’s possible that the distinct patterns, along with scent markings, help tigers identify each other. The greatest threat to tigers’ survival is humans. Their beautiful fur serves as a significant incentive for poachers, and a black-market trade exists for fur coats, wall hangings and rugs. Their bones are valued in traditional Chinese medicine. 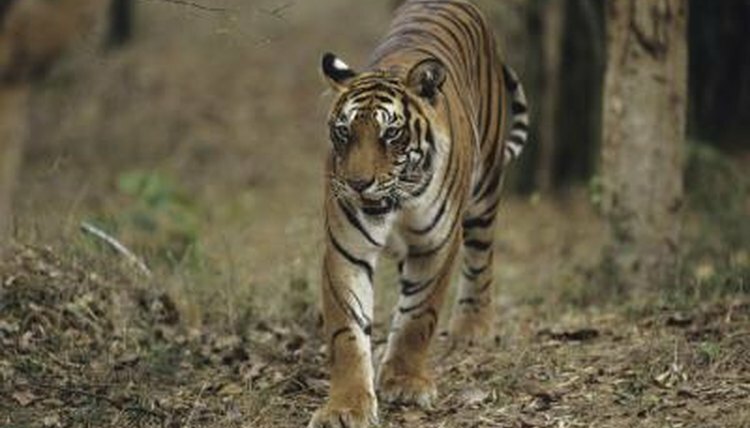 Along with habitat destruction, excessive hunting has decimated some subspecies, such as Siberian, South China and Sumatran tigers, which now are critically endangered. Conservationists believe that tigers' beautiful appearance and charismatic charm can help preserve the species. Zoos are implementing species survival plans, and ecotourism programs have launched in some areas with large tiger populations. In Which Countries Do Black Leopards Live?